In this 5 minute masterclass we’re going to take a look into the "So What" chord voicing and what it keeps inside. We will not be talking about the basics of the so what chord, if you’re not familiar with it, go and check out the beginner lesson, you can find the link in the related lessons section below. There are two main ways to apply so what chord; first keeping the form of the chord the same and playing it inside the key. With this you can find interesting voicings for different scale degrees, now lets take a dominant chord as an example. The second way is to use different inversions of the chord. It’s a 5 note chord, and so that gives us 5 possible inversions. Again, it gives us plenty of voicing material to use. 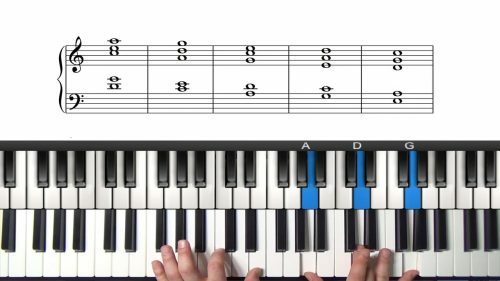 Also if you want to explore even more, you can combine these two ways: take any of the inversions and play that in the same form inside the key. We’re going to take the first 4 bars of Sonny Rollins’ blues "Sonnymoon For Two". Using this approach, you can use the so what chord to harmonize melodies and give your comping more options. The So What chord voicing contains all 5 notes of the pentatonic scale. That’s why it works so well in so many different harmonic situations. This lesson is closely related to the ‘Pentatonic Improv’ lesson so if you haven’t already, I’d recommend you check that out first. Before exploring these advanced applications, make sure that you are comfortable with the basic application of the So What Chord. 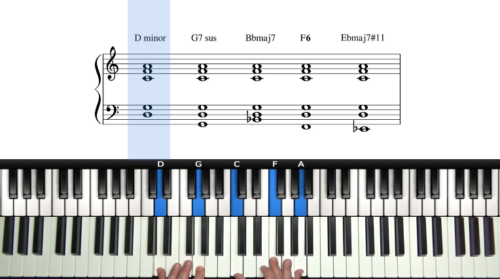 You should be able to play the voicings in all 12 keys, as demonstrated in the related lesson above. Experiment with the sound of diatonic So What Voicings over the different pedal points of the major scale. When inverting so what chords, start with just a few keys. 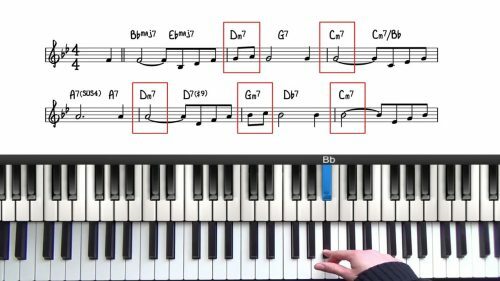 These inversions can also be played over different pedal points to access a wide selection of versatile comping voicings. Also, check out the related topic "Pentatonic Chord Voicings" - see the related lessons above.